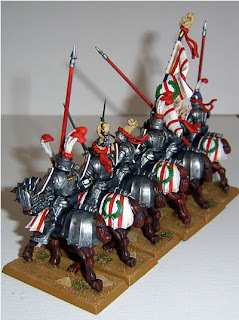 Another week, another load of painting; actually, the first item here was finished some time ago, before the knights below, but has only just made it to photo's. 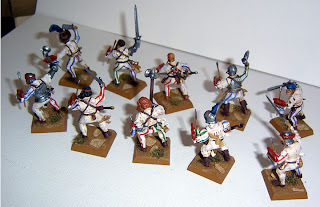 Allesandro Panini is a rather late arrival for leading his mercenaries into battle. 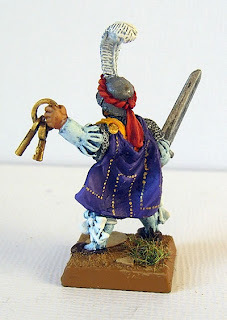 I'm not convinced about the purple and gold cloak, but I do really like the yellow sash. Overall this was a figure I was glad to see the back of, as it were. 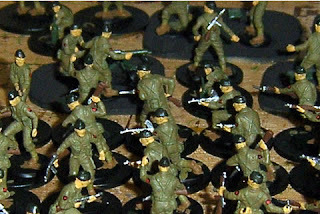 32 figures organised into three 9-man cells a mortar team and a HQ with a military advisor. Watch out for these guys on sale soon. 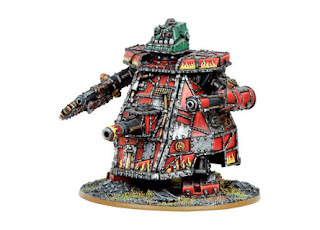 Alas at the minute I'm slightly below the 2:1 ratio I'd see as the minimum acceptable, and way off the 3:1 I'd see as optimal; but this is partly due to the new GW 40k boxed set; of which I not only bought one, but then purchased a separate set of the Ork sprues from it. This is, I accept, the unacceptable behaviour of an addict. And I am now trying to stop any such activities, and get on instead with churning out some of the piles of plastic and lead lying around waiting to be done. There's only two months left of my painting season, so time's pressing too! 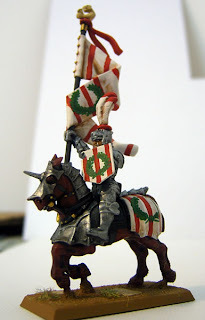 I quite fancied doing painted armour, and this is my first real try at it. I suppose it shouldn't be that difficult, as I paint cloth and so forth all the time. The stripes were always in mind, but it took some time to decide on the wreath. I was tempted to add a crown over it, but that was going to get a bit fiddly. The Commander, notice his piercing eyes? I experimented in an effort to stop all my figures having a wild stare. The solution was simple, before applying the white to the eye, paint the same area a deep reddish brown; then apply a narrow line of white and then spot with black for the pupil. The result is somewhere between eyelashes and mascara, but really helps I think. By the taste of eventual victory. An amazing turnaround in the last week of the club campaign saw the Dogs of War finally prove their worth in battle. I decided to discard the Pike block for the last batch of games, as it had underwhelmed against every opponent. In such a small game it didn't seem to earn it's keep. 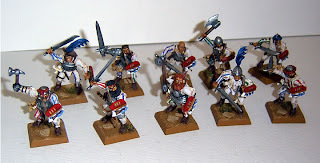 Instead I went with a newly finished unit of knights, and a unit of Ogres seconded from my Orc army. The results were impressive to say the least. Though not without shortcomings. 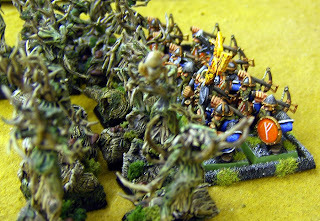 Firstly up against the High Elves that had previously given me two good beatings in the campaign, I was able to concentrate my forces, delivering three charges in the same turn to devastating effect. 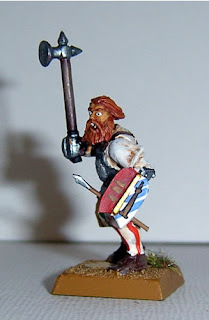 Soon his entire army comprise a bolt thrower and a nervy crew. 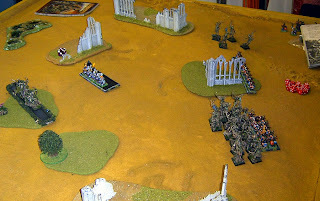 In my second game An Orc force almost caught me on the hop, with their surprisingly useful 'Waaagh!' action. Fortunately the centre held for long enough for my cavalry to save the day. Tactically it was more of a gamble but it paid off in the end. 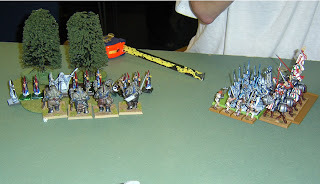 In my third game of the night I faced a Dwarf 'gunline' (Two units of crossbows and an organ gun) which set up way to the back of the table having placed all the scenery on my side of the board. 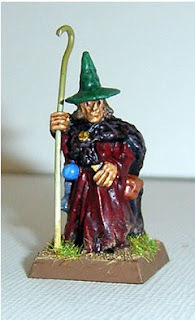 It would obviously be like crossing the Somme trying to attack him, so after one failed attempt, I concentrated on using my Wizard and own unit of bows to wear him down, whilst hiding my prime units. In the end I just did enough by wiping out his artillery crew to claim a draw. So three games, producing two solid wins and a draw. Sadly I finished last in the campaign, on the basis of losing my previous 7 battles, but having allied with the forces of chaos in the final week, I ended up coming out on the winning side! The surviving mercenaries at least got paid an acceptable bonus. 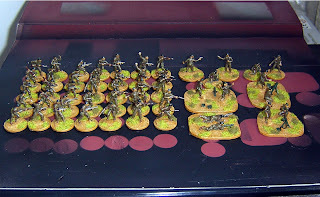 At the end of the campaign the Dogs of War redeemed themselves a little, and I do have a new 1000 point army to show for it. Will I keep them though? I don't know. 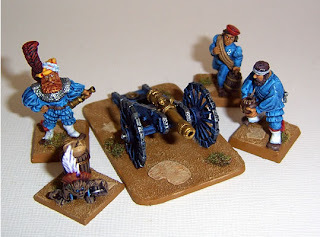 As for a format for a mini campaign, either narrative, like this one or map based (with, simple, logistics, as I prefer) border patrol sized games are ideal for rapid progress without getting tied down into a commitment to one game type. Despite the bad start, it was a worthy exercise. 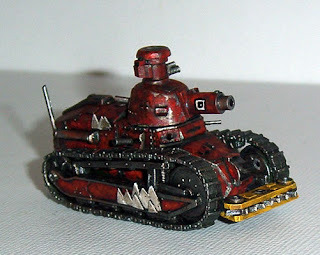 And coming up next is the same for 40k; I'm already preparing my Orks for the challenge! Not personally mind. 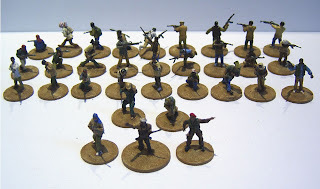 In a cynical effort to improve my painting totals, AND in the faint hope of recouping some wargaming funds into the PayPal account, I knocked up a Rapid Fire battalion of Royal Marine Commandos last week. I'd trawled the piles of figures bought when I was a child and found more than enough Matchbox and Airfix figures for this little project. However, heavy weapons were thin on the ground, not having survived the ravages of childhood, if provided at all. As memory serves both makers sent their Commandos to battle with a good selection of Knives, grappling hooks and ladders, but little in the way of machine guns or mortars. Therefore I had to scratch-build some heavy equipment. Out with the plasticard. 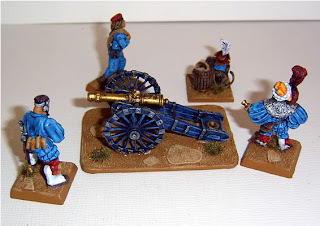 The models were based mainly on coins, but the heavy weapons are on Artboard; presently the best supply of this appears to be WHSmith, who sell 5 A4 sheets for £4. 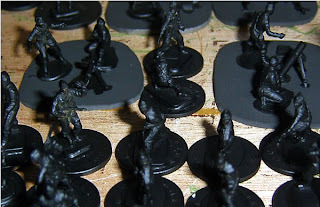 They were undercoated with spray black, something essential for plastic figures if using acrylic paints. Next the base colours were applied. 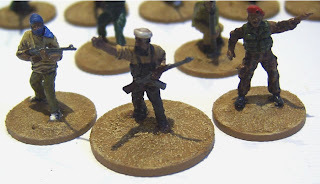 More modern references (such as the recent Osprey book) show the Commandos in a browner garb, but I went with my older reference material and a more classic and distinct greenish brown. I was even able to add the Commando patch on the arms. For the finishing I experimented with the different GW washes and settled on Devlan Mud as looking best overall. 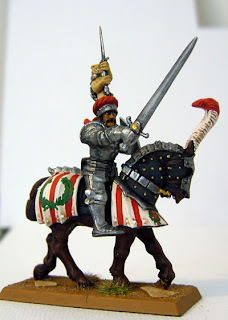 A generous layer of this was applied and then it was on to basing. 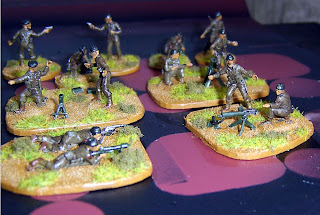 I glued on a layer of Sand (using my ever favoured PVA woodglue, undiluted), which was then painted a basecoat of light brown (Dulux custom mix sample tin - £2 for 250ml of your choice of colour), then highlighted with desert sand followed by a light beige. I added static grass, and then a new product to me, clump foliage. This was a simple product to use, but whereas the static grass is applied to spread out glue, I found quickly that the foliage worked best added to a blob. It is easier to get a good finish by pushing a batch of it lightly onto the glue and then letting the excess tip, or be brushed off. And here in close up are those scratchbuilt weapons, and the finished product. Finally got another game of Axis and Allies: War @ Sea a couple of weeks ago. 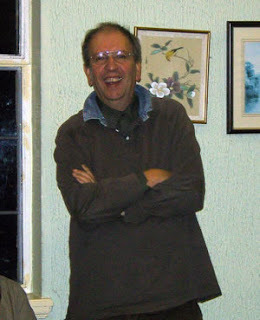 Trevor from the club was keen to give it a go, spurred on by reading naval histories I understand. So I brought along all the doing and we set to. We used my tabletop adjustments, naturally; I'm biased off course, but I think it's the ONLY way to play the game! 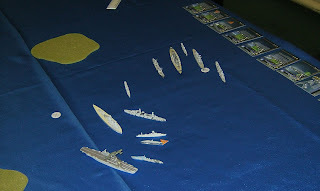 The Fleets were each of 150 points, myself the Brits, whilst Trevor took the Germans. To the best of my recollection I fielded a carrier, a battleship (The Rodney), a cruiser, two destroyers, a submarine, fighters, torpedo planes and a patrol bomber; so a bit of everything really! Trevor, opted for The Bismark, the Admiral Hipper, The Koln, an auxilary, a destroyer, a couple of subs and a selection of similar aircraft to me. It was a gun heavy force compared to mine. 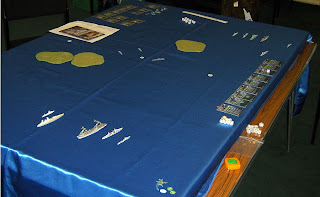 Initial deployment on a 6x4 table with a couple of low islands blocking our view. As the battle played out, my submarine was discovered early and my fleet conversly suffered from an ambush by his. My battleship and carrier both suffered early on. However I was able to neutralise his subs and reduce his air power compared to mine. But it was as the German big guns came to bear that I began to really suffer, the Rodney was more than a match for The Bismark alone, but the supporting cruisers of the Germans comprehensively out gunned me. Admiral Von Trevor gloated of course! By the end the Rodney and my cruiser had sunk to the bottom, and the carrier was running. But that was a darned good little game. And it had got me thinking too about some simple advances to make to my tabletop rules; expect to see a second supplement on the blog soon. Elsewhere a variety of games were going on, but the only one that caught the camera's eye was this DBMM (the new version of DBM, unsurprisingly) game in 15mm. 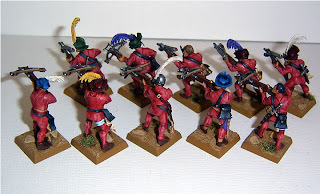 Won't help theses chaps win any battles it seems, but still from a painting standpoint, more units are finished. 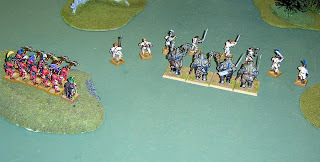 All efforts so far have proved to nought however; their last engagement was against a Dwarf Slayer army, and although it was a close run thing, when it counted, my pikemen wavered (before rallying it has to be said) and let the opportunity to inflict a crushing defeat slip away. 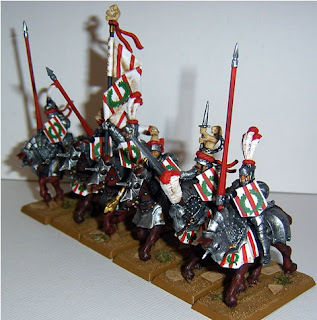 Another unit is already finished, but so in general do I think this army is; it may well be on it's way to eBay at the end of the year. OK, first a confession; I actually have presented these models in the opposite order to which I made them. 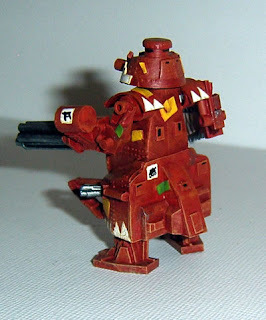 The FT17 to Gunfortress conversion below was made first. 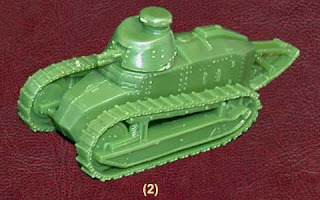 In terms of conversion, I didn't actually do all that much, and it shows in the profile of the tank. Naturally I wanted it bristling with guns, though in this scale it's easy to get away with just drilling small holes and inserting wire. 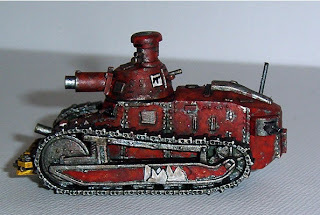 To Ork it up a bit more, I fitted a large close combat device (chainsaw) to the front and patched the surface with 'teef plates'. 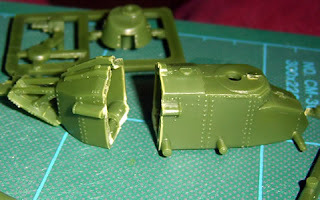 On reflection I think I should have added some sort of artillery platform to the engine cowling, or simply done more with the side of the hull to break up the shape. 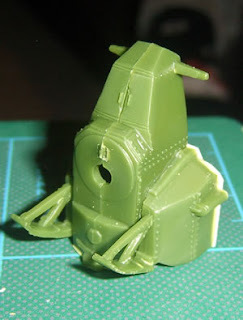 But it will fit in well with my other gunfortress (a 1/87th scale T26), and as a quickie it was OK. Moreover it gave me the idea to build the more ambitious Gargant below. Indeed, here they are both together, with some Orks for scale. 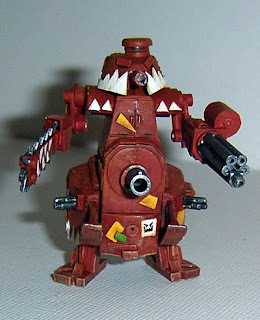 Impressive, though seeing this photo, I'm even more sure the Gargant needs a 'wash' too. 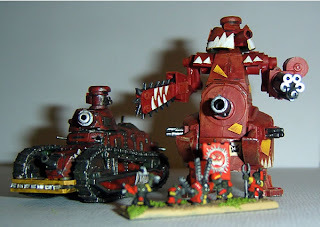 Buoyed up by my game a couple of weeks ago; I had a fresh look at my Epic scale Orks for the first time in, well years. Lots of troops, hordes of vehicles, and a couple of war machines too. But there was definitely a gap. 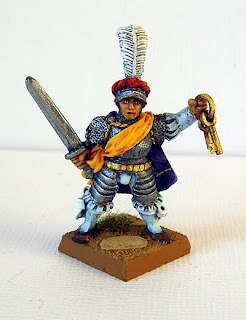 Although I picked up a Mega Gargant on Ebay some years back, in game terms it is simply overkill, being well over a third of the points of a normal army on its own. I fancied putting a mid-sized gargant into the fighting line. 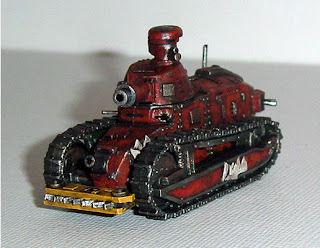 The other problem with these is that they are very uniform, GW only make one model and yet Orky vehicles to my mind should always look different. I decided to take another route; both to save cash and make something suitably unique. I picked up the HaT, FT17 tank set instead, a 1/72nd scale kit. You get two of these simple models for a mere £5.49; they only comprise seven parts each! Looking at the model I concluded that I could cut the hull down and turn it on its end to make a body for my gargant. This was simply done with a good craft knife and a steel rule, no need for fancy tools. I was at first thinking of using the rest of the hull for feet, but once cut off I discovered they made for a near perfect fit on the sides of the hull to extend it and transform the shape. Some minor trimming of the old track attachments and we were on. A back plate needed adding to cover the gaps, but this was an easy fix. Next I worked on the head and shoulders and started to add some of the weapons. 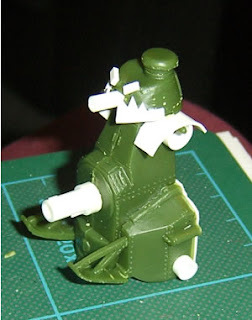 The turret would make a perfect Orky head with some additions, whilst it's old location, now in the middle of the hull would dictate the position of the gut cannon. 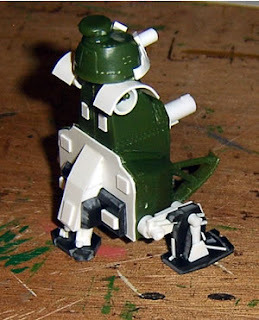 Next I worked on some articulated legs. Initially I went for a three legged CP-30 style arrangement. But it just didn't look right. I slept on that idea, and in the morning tore the legs off and started again. If it is possible, they had actually made the vehicle look less plausible, as if a thirty metre tall walking tank wasn't unlikely enough! The camera didn't get remembered during the rest of the build, but I chopped most of the legs off and used the rest to glue under the hull in a more believable fashion. The back leg was ditched as a non-starter. 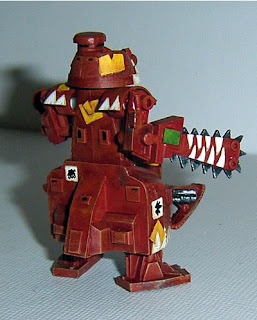 The remains of the legs were transformed into arms easily enough, and one was fitted with a massive chainsaw (very Orky) and the other with a huge Gatling gun. By this stage all that remained was to add a few details, like repair plates and so on; and it was complete. As for the paint job; well it had to be red didn't it? I went with some classic detailing, White teef, yellow and green patches for repairs. Some bare metal, scratched off, and a coat of dust on the lower portions. A vehicle this size if it could move at all, would surely kick up a storm of debris. I'm musing whether it needs a wash of brown or black to add some more depth at present, but it's definitely ready for the table. At some point in the last few days I broke the 10,000 page hits barrier.